Released over this past weekend, the new Hot Wheels Power Port app is an augmented reality experience that is made to work with your Hot Wheels track (or even independently of it). 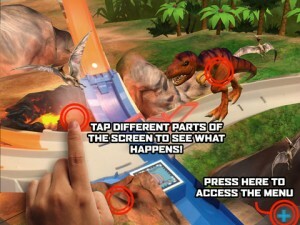 Like many other augmented reality apps, Hot Wheels Power Port uses the iPad camera technology to function. These special glyphs can be downloaded and printed from the Hot Wheels app page. There are even special “off-track” glyphs that can be used to bring special surprise characters to life on the iPad screen. All of the augmented reality scenes are completely interactive and can be touched and tapped to reveal surprises. Touch the shark to almost lose a finger! Tap the cyborg to duel a scary robot! Touch the tornado to get up close and personal with one of nature’s most amazing storms. If your kids love Hot Wheels and would like to experience using glyph markers and augmented reality with Hot Wheels Power Port, click the Apple iTunes App Store button below to download the app for free!